When oil prices were soaring, investors willingly jumped into the market. Things were so good that many were enticed into companies that, in hindsight, have turned out to be highly risky, and financially costly, investments. What if, instead, you owned an industry stalwart like ExxonMobil (NYSE: XOM)? Sure, you'd expect the oil price decline that started in mid-2014 to hurt. But you could be pretty confident that it wouldn't lead to a near death experience. To give you an idea of the difference, look at troubled Linn Energy's unit price, down nearly 99% since oil prices started to fall, and compare it to Exxon, which is down just 16% or so. Moreover, Exxon happens to be one of the best run oil companies in the world, with its return on invested capital routinely besting peers. And financially speaking it's a rock. In fact, as other oil companies have faced credit downgrades of late, Exxon's AAA credit rating has yet to be cut. Dividends, meanwhile, have continued higher despite the industry turmoil. If you are looking for a rock in a storm, Exxon is one that you can hang on to. Another name you might want to look at is Nucor (NYSE:NUE). This U.S. steel giant has been hit by an industry downturn that started way back during the 2007 to 2009 recession, just like every one of its competitors. But unlike competitors, it's managed to hold up really well. For example, Nucor lost money in 2009, but has been in the black every year since while competitors have been bleeding red ink. Nucor's strength comes from a couple of different sources. For starters, it uses electric arc furnaces. They are generally cheaper and more flexible than the blast furnaces that make up the backbone of many competitors. But there's also the fact that Nucor's pay structure is designed to reward employees when times are good and trim compensation when times are bad -- which is a huge benefit during the lean years. 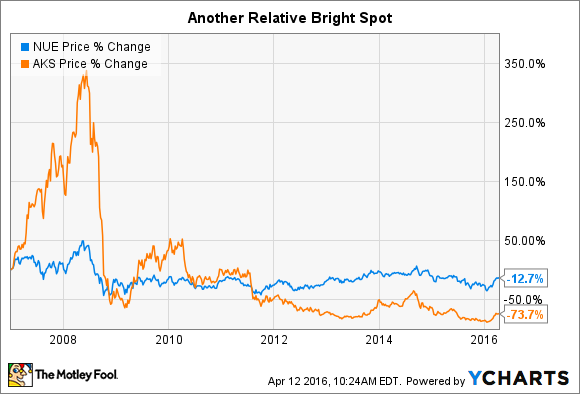 Add to this information the fact that Nucor has a long history of investing during downturns to strengthen its business, so it comes out the other side a stronger company, and the appeal gets even greater. For example, Nucor has been building new plants and selectively buying others, such as the 2014 buy of Gallatin Steel, during the downturn. And, just for reference, since 2007, Nucor's stock is down a touch under 13% compared to a struggling competitor like AK Steel, which is down about 75%. Big difference, but that type of stability can keep you in the game when others are running for the hills. 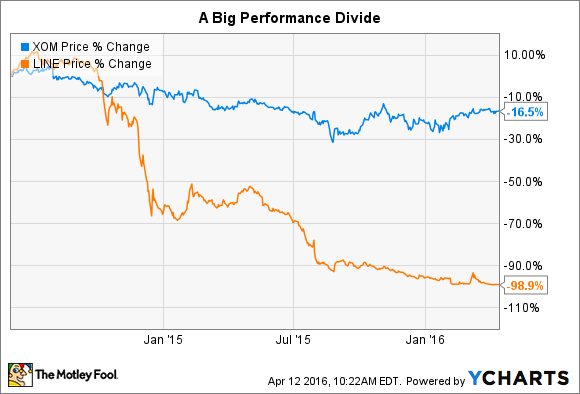 Nucor's over 40 year history of annual dividend hikes doesn't hurt, either. Another company to take a look at is Eaton Corp. (NYSE:ETN). This industrial giant is focused on power management. The interesting thing is that times are tough throughout the industrial sector right now and Eaton is taking its lumps. For example, organic growth expectations started last year in positive territory but the actual results came in at negative 2%. The company's expecting another small decline in 2016. To be honest, Eaton's stock has been pretty volatile. At one point in January it was down over 35% from the highs reached in 2014. But here's the thing, Eaton earned more than $4.20 a share last year and expects to make between $4.15 and $4.45 a share this year. In a difficult market for industrial companies! It's a lot easier to stick it out with a wildly profitable company than it would be if you were looking at oceans of red ink. Add in a solid dividend in the mid 3% range that has been steady to growing over time and the allure is even greater. One more name that might help you stick around the market is Royal Gold (NASDAQ:RGLD). Owning a company tied to the often volatile price of precious metals might seem a hard pill to swallow. And if you were to buy a miner like Barrick Gold (NYSE:GOLD), I'd agree. But Royal Gold isn't a miner, it's a streaming company and that changes the equation a great deal. Streaming companies provide up front cash to miners, like Barrick, in exchange for the right to buy gold and silver at reduced costs in the future. So they don't face any of the risks associated with running a mine and they inherently have a low cost structure. In the precious metals world, Royal Gold has a pretty nifty business model. Now I could harp on the value of owning gold in a portfolio as a hedge, which is totally true. But what really sets Royal Gold apart is dividends. Not only have Barrick's shares taken a hit as the price of precious metals have declined, but it has also been forced to cut its dividend. Royal Gold's shares are down, too, but it has increased its disbursement annually for 15 consecutive years. It's a lot easier to hang around a company when it gives you a "raise" every year. That's especially true for a volatile sector like precious metals, even when you own them for diversification purposes. If you are like me (and just about every other investor), fear and greed play a big role in your investment life. When you look at potential buys, it pays to consider the ones that will keep you around not just in the good times, but also through the bad ones. That will help you avoid the curse of buying high and selling low. Royal Gold's consistent dividend should help keep you in the precious metals space, an important portfolio diversifier. Robust earnings should help you stick around at industrials like Eaton. Financial strength and industry leading businesses will do wonders for your fortitude with Exxon and Nucor, in oil and steel respectively. And all four are very likely pay you via solid and generally growing dividends while you conquer fear and keep yourself invested during retirement.